VILSHULT is an IKEA ready-to-hang photo of Amsterdam that has been sold over 427,000 times. After many of my friends asked me why I bought such a “mediocre” photo for my living room, I decided to find out how this photo was made and how it ended up on IKEA’s shelves and in almost half a million households. What I learned was fascinating. I made the 14-minute documentary short film above about my quest to learn the story behind this popular IKEA photo of my hometown. More of the backstory at Petapixel: The Story Behind That IKEA Photo of Amsterdam. Great story, very well done. 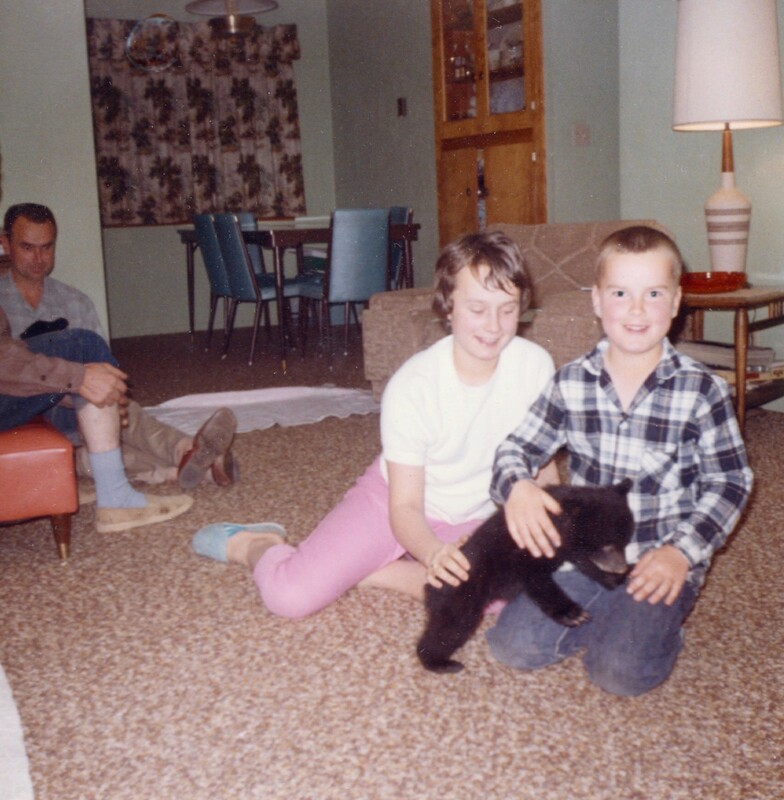 Bob and Susan Sharp playing with a bear cub, Gordon Sharp in the back. April, 1965, Reedsport, Oregon. My Flickr contact and friend Gary Sharp has been scanning old photos he’s digging out of boxes at his mother’s house. These two are terrific and tell a great story. 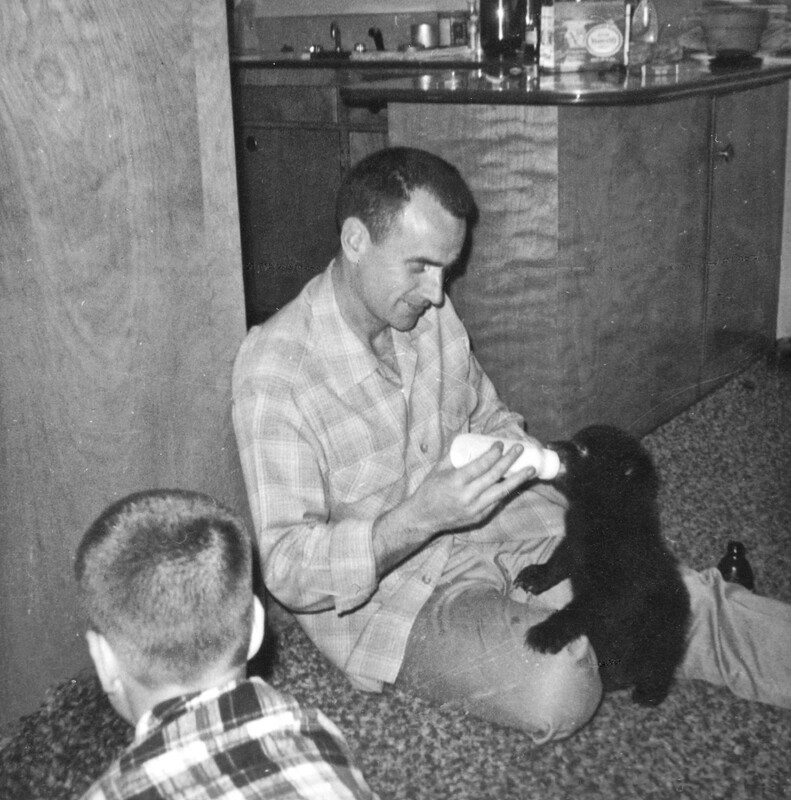 Gordon Sharp feeding the bear cub, April 1965. Reedsport, Oregon. This post and story is part of a three part story: getting the idea for a climb, preparing for the climb, and doing the climb. Stay tuned for parts two and three. The images posted here were shot with an Olympus XA (film) camera on cheap movie reversal film. A number of years ago I realized that the slides were in bad shape, so I had them professionally scanned. The original images weren’t great and years of dust and rough handling did them no good. But, they do help tell these stories so I use them without much cleanup. Doing a search on Flickr for “lost arrow spire” or a Google image search will give you many more modern and clearer images although of course, not of our time there in the 1970’s. Just to whet your appetite and give you a sense of what this is about, here’s a small piece of a youTube video shot with a drone above the Lost Arrow Spire in 2017. This is a modern day look at the same formation this post is about. The images in this post were shot in 1977, 45 years earlier. 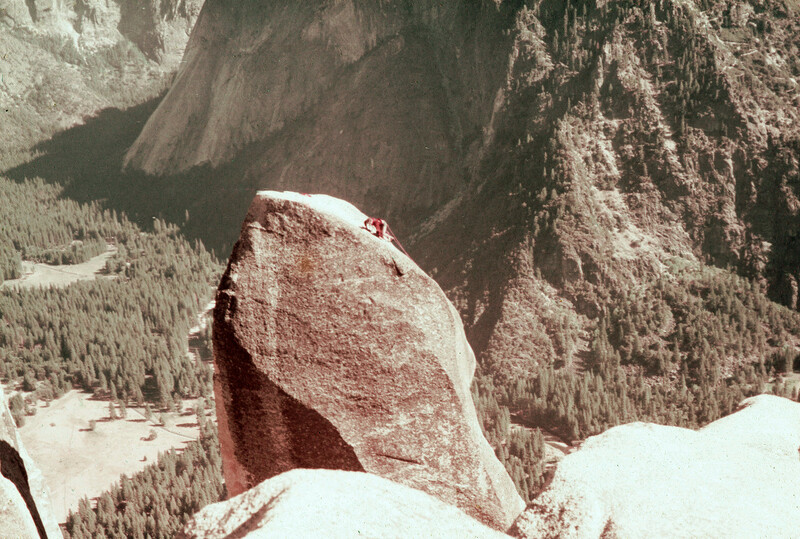 In the summer of 1977 my then girlfriend Faye and I were in Yosemite valley on a climbing trip. We were what would have been called, solid 5.8 climbers (not beginners, but not hotshots). Occasionally we did harder stuff, but we were both leading moderate climbs like The Nutcracker, Royal Arches (the rotten log was still in place) and a variety of great climbs on the Glacier Point apron. 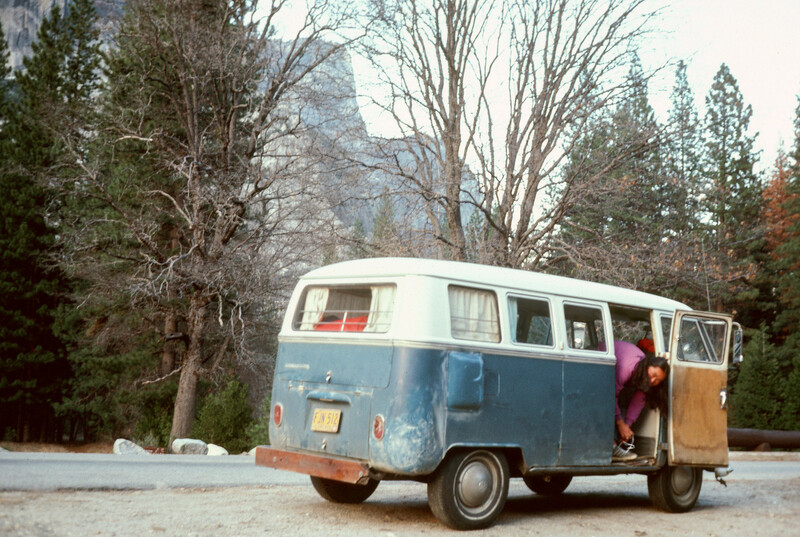 We both had Volkswagen buses which had camper interiors and we travelled and stayed in one or the other on these trips. It made it possible to get some sleep and avoid the all-night Camp 4 climber parties. Both of us had done easy aid routes back at Smith Rock in central Oregon (the Pioneer route on Monkey Face) and had practiced aid climbing at our local climbing spot in Eugene, the Columns, but we hadn’t done a big wall or a route in Yosemite with a lot of exposure. From almost anywhere in the central part of Yosemite Valley (the “village” as it’s called), you can see Higher Yosemite Falls and Yosemite Point. If you know what you’re looking for, between the falls and the point is a detached pinnacle called The Lost Arrow Spire. It’s like a thumb sticking out from the cliff face, about 200 feet tall from where it detaches. 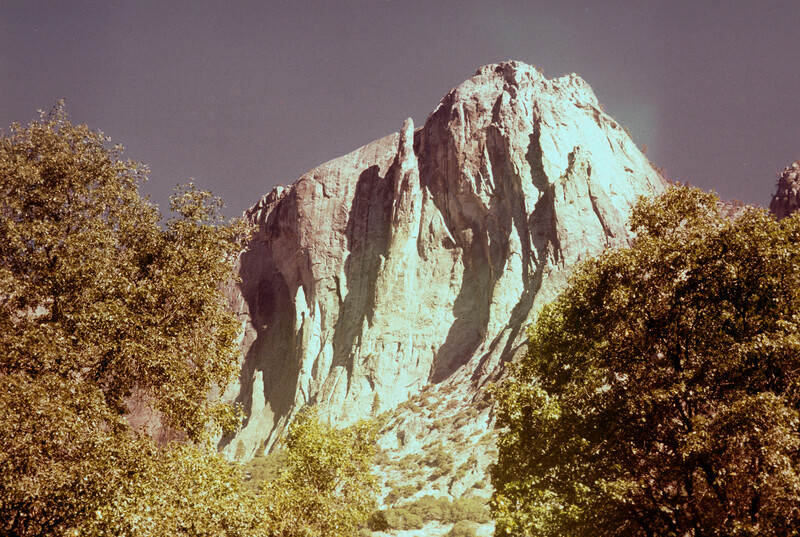 This is the scouting picture I took from the valley floor in 1977. The falls (dry here) is behind the tree, Yosemite Point is the high point and the Lost Arrow is between. 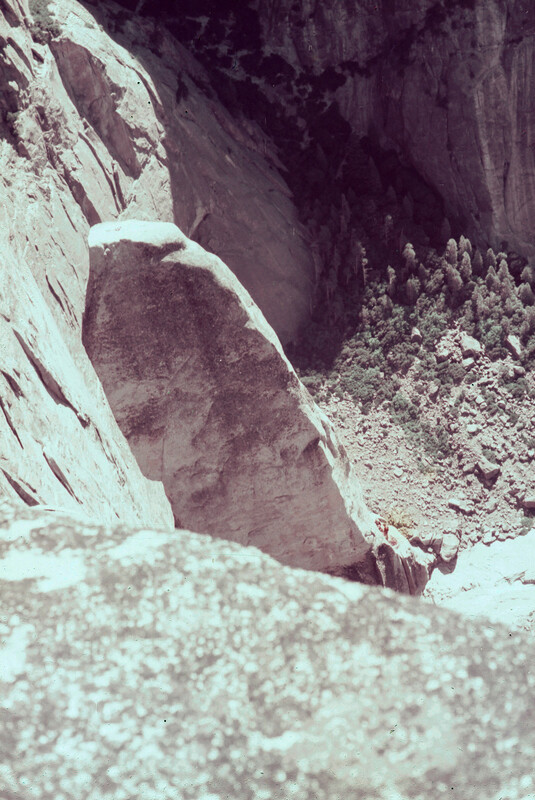 The complete Lost Arrow (from the ground to the tip) was one of the first big walls climbed in Yosemite using modern methods: pitons, ropes, carabiners, webbing stirrups (aiders), a leader and a belayer. It was done in 1947 in a five day push by John Salathe and Anton Nelson. They went up the chimney on the west side (left in the image above) of the arrow from the ground to the top. When they got to the notch, where the pinnacle becomes detached from the wall, they camped out there and spiraled around to the east side, making their way up two ledges and then precariously, up the last 150 feet to the top. Since then the popularity of the complete climb, from base to tip has diminished as the lower climbing isn’t all that aesthetic. The tip has remained a bit more popular although during the 1970’s, an era of extreme free climbing, this particular climb was not done often, maybe ten times a summer, if that. 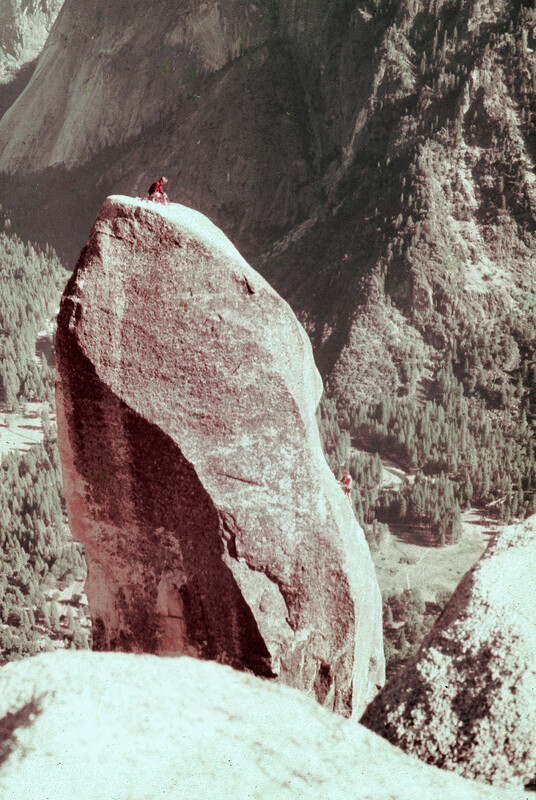 To do the tip by itself, climbers hike up the Falls trail to the rim of the valley, just west of Yosemite Point. There they set up a rappel into the notch and climb the arrow tip. 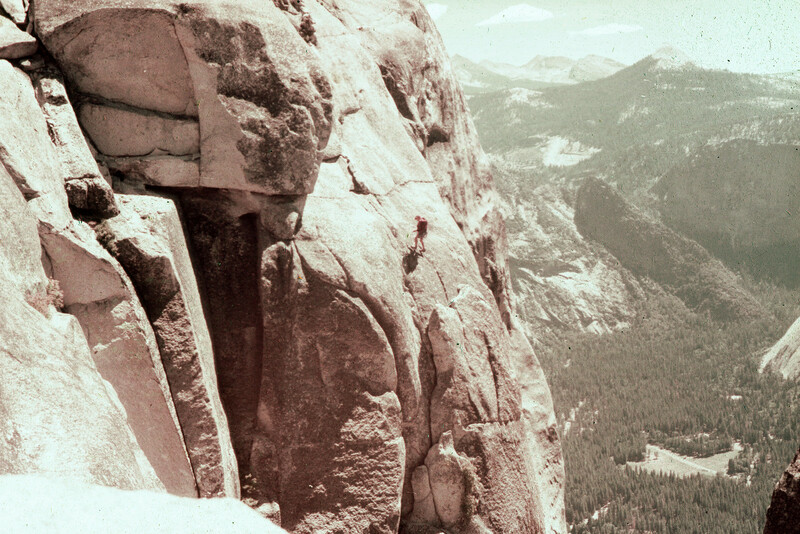 That climb is documented in the 1971 edition of the Climber’s Guide to Yosemite Valley, by Steve Roper. No doubt later editions of the Roper book and other newer guidebooks have updated route information but below is the route information that Faye and I had as we contemplated this climb. Grade III, 5.5, A3. 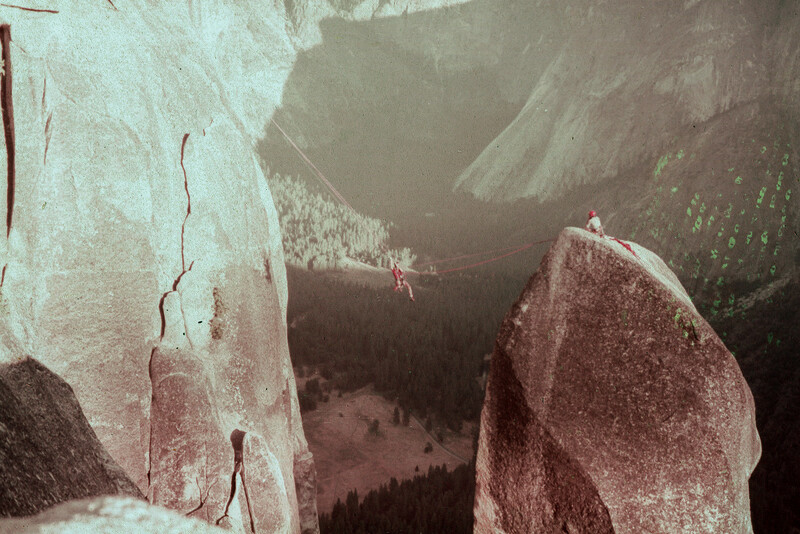 First ascent in September 1946 by Fritz Lippmann, Jack Arnold, Anton Nelson and Robin Hansen. This party gained the summit after engineering a Tyrollean traverse. The first climbing ascent was masterminded by John Salathe who, with Nelson, climbed the pinnacle on the fifth day of their route from the base. 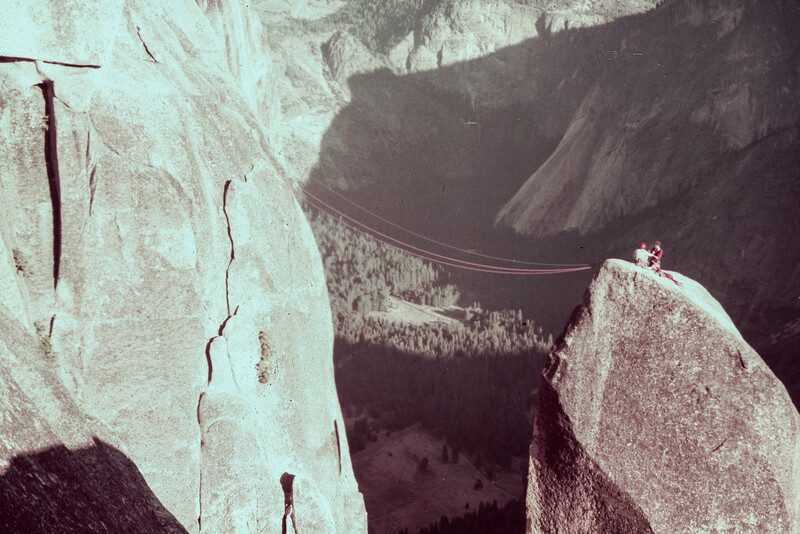 From trees 300 feet west of the railing at Yosemite Point, rappel 130 feet to a large ﬂake. Next, rappel 115 feet into the notch. Both these ropes must be left in place for the return; the lower end of the lower rope should be secured in the notch to prevent its swinging out of reach. From the sinister notch walk out a narrow ledge on the east face. Nail and free climb 35 feet to a good belay ledge. Climb left around a rotten corner, then nail 20 feet to Salathe Ledge, an excellent, relaxing belay site. The 3rd pitch is the crux: traverse left a few feet, nail for about 20 feet, then move left and nail up to a sling belay at the base of the “ﬂint-hard and ﬂawless Arrow tip.” On the last pitch, use bolts and 2 pitons for aid. Two rappels (125 feet and 70 feet) lead (back) to the notch. The nailing on this magnificent route is continually changing and challenging. Nelson, speaking of his 1946 ascent, has written: “as we further diminish the crack’s possibilities, it becomes doubtful that many others will ever climb the Lost Arrow.” By 1970 the pinnacle had been climbed over 200 times and the cracks were still getting worse. What were horizontal piton cracks in 1960 are now inch-angle cracks. The rating remains the same, but the hardware changes. A 1971 selection should include about 15 pitons: one- third horizontals and the rest angles to 2″. The grade (in this case III) is the length the overall severity of the climb. Very few three or four pitch climbs are rated grade III and the fact that this one is is because of it’s location: 2000 feet above the valley floor. That means that while the climb itself is challenging, the exposure from doing the climb at that height is part of the challenge. Given that Faye and I had not done climbs with similar exposure, this certainly gave us pause. We had done the Royal Arches Route, another grade III but that climb, while over 1000 feet long is low angle and has little exposure (except for what was the rotten log pitch which was terrifying). 3rd class: no rope, not too dangerous but don’t fall. 4th class: leader has a rope, no protection used. Follower is belayed up. 5th class: leader has a rope, is belayed, uses protection in case of a fall. Because most climbing is 5th class that class has been divided into a decimal system to describe the difficulty of the climb. 5.0 is very easy, initially 5.10 was the toughest, but as climbing has advanced, the decimal system has expanded to 5.10 a, b, c, and 5.11, etc. The leader and belayer tie into each end of a rope. The belayer anchors himself to the rock such that if a leader falls from above won’t pull him up or off the rock. The leader climbs up, say, 20 feet and puts in a piece of protection (piton, chock, clips into a bolt, etc.) and attaches a carabiner and most likely a sling and another carabiner to it, then clips the rope into the end carabiner. If the leader then climbs up another 5 feet and falls, the belayer holds the rope and the leader will fall a bit over 10 feet: double the distance to the last piece of protection plus some rope stretch and slack and the length of the sling. When the leader gets to the top of the pitch (a bit less than a rope length or a convenient stopping point) he anchors himself and brings (belays) the belayer up with the belayer taking out all the protection). This is how all roped climbing works. With free climbing, the leader just uses the protection as protection, he doesn’t hang onto it to advance. With aid climbing, the climbing is hard enough so it can’t be free climbed and so, protection is also used to hang onto to advance. Of course, over many years, what was aid climbed now might be free climbed, as free climbing standards have pushed on. Many pitches have mixed free and aid on them: a few free moves, hang on a bolt, a few more free moves, stand on a piece of protection, etc. This is all determined by the skill of the climber and how good the protection is in case of a fall. Bad protection means less risky moves. The aid rating, A3 is what gave me pause. Given the description and the rating I wasn’t sure we had the equipment or the skill to do aid climbing at this level. Aid climbing can be as simple as climbing a bolt ladder: clipping into a series of expansion bolts, each about 5 feet apart (placed by earlier parties). Clip into one, attach a nylon ladder or aid stirrup to it, climb up as high as possible, clip into the next and repeat. Or, if there are no bolts, aid climbing can involve inserting various things into a crack to hang off of. Pitons, chocks, hooks, mashies, bashies, copperheads (some of these are soft pieces of metal on a swedge wire that are hammered in) or “rurps” (“realized ultimate reality pitons”). These last gadgets are precarious and many placements of these will hold body weight but won’t hold a fall. This means if you place two or more of these in a row to advance and the top one pulls, you’re looking at what is called a “zipper” where a whole line of them will pull out and you’ll fall further. Given the Roper description of the crack on the Lost Arrow becoming messed up through years of piton use, I wasn’t sure what shape it would be in when we found it and what gear to bring. Most importantly, I wasn’t sure if either of us had the skill or guts to place the gear to get to the top. Once you’re in the middle of an A3 pitch, turning around is difficult so I didn’t want to do this climb if we weren’t prepared. Also, at this time, 1977 climbing was going through a transition from the use of pitons (dirty, destroys cracks) to the use of stoppers and hexes (clean, leaves cracks un-harmed). Later expandable protection would be invented but we didn’t have it at this point and most people carried a mix of pitons/hammer and chocks for a climb like this. So, all of this gave us pause but it’s great to have dreams and we decided to do a scouting trip up to the Arrow itself to check it out. We packed water and lunch and hiked up the Yosemite Falls Trail, crossed the stream that forms the falls and hiked over to Yosemite point. To our amazement and luck there was a party of three doing the climb so we were able to watch how they set it all up. The climbers had helpers who were staying behind on the valley rim. We later learned why: they were going to toss a rope to the climbers once they reached the top of the Arrow so that the climbers would do a Tyrollean traverse to get off the tip. This seems like a scary proposition but in fact, while very strenuous it’s not as scary as it seems. Still, Faye and I decided we’d try to do it the traditional way by doing the climb and then depending the outside of the spire back to the notch and leaving two ropes in place to climb with ascenders. This is what the Roper guide recommended and it seemed doable to us. It was tough to find a good vantage point to watch the three climbers from but we found one just west of the rappel point. Here you can see the first climber rappelling down. The rope he’s descending is hard to see but its there. The ledge he’s going to stop on is just below him. Note that he’s got another rope over his shoulder. He’ll anchor that rope to some bolts above the ledge and drop that rope into the notch below. Then he’ll rappel into the notch and the other two climbers will rappel down. Traditionally these ropes are left in place to ascend out of the notch when the climb is done. These folks got off the Arrow tip via Tyrollean traverse (below). You can see a small piece of the Arrow in the lower right of this image. Aside: The ledge he’s going to is almost exactly level with the arrow tip and slack liners set up a slack line between that ledge the arrow tip and walk it. That wasn’t done in 1977 but it’s been done for the last 25 years or so. Search around on Google and youTube, you’ll see many images and some videos of folks walking the line here. The first two pitches of this climb were out of our sight; they’re on the east and southeast face of the spire. The next time we caught sight of these climbers they were at the second (last) belay ledge in the lower right of the next frame. Because of foreshortening it looks like they’re close to the ground but in fact, the boulders under them are about 2000 feet below. The long aid pitch above Salathe ledge is the crux of the climb and it took the leader many hours to climb it. In the Roper guide its recommended to stop before the top and clip into two bolts and do a sling or hanging belay to bring the second climber up. It was essential to do this on early climbs because climbing ropes were 150 feet long, not the later 165 feet. That extra fifteen feet makes it possible to do this crux pitch in a single push but it also makes the rope drag at the top tough. The next image is the leader doing the last bit of free climbing up the arrow tip. Given the length of the pitch below him and the amount of protection he had to put in, the rope drag (the friction he’s got to work against) is horrendous as he makes that move. It’s easy climbing but between lack of protection (the last bolt is ten feet below him), rope drag, and exposure, it’s tough although when I took this picture I had no idea and if memory serves, he made it look easy. You can see a red nylon sling to his left near the tip, that’s the belay point and there are at least two bolts there. He’ll tie into that and belay the others up. In this next shot the leader is on top, not doing much (not belaying) because the rope is tied off and the second climber is ascending the rope with devices called ascenders. You can see the second climber on the right edge of the arrow. Ascenders are metal handles with enclosed cams that allow a climber to slide one up the rope but the cam will pinch the rope and not allow the handle to slide down. Attach stirrups to each of the ascenders and you can easily climb a rope. This is how big walls are done and in this case, the second climber is cleaning the protection from the pitch and the leader doesn’t have to hold the rope for him. The next image shows two of the tree climbers on top and the Tyrollean traverse is all set up. The folks on the cliff side have already tossed a rope over and pulled ropes back and the “clothesline” is all anchored and ready. The third climber has already crossed and two climbers are getting ready. This last image shows the leader crossing the Tyrollean traverse. He’s using his ascenders and pulling himself across. As he gets closer to the other side it gets steeper and tougher. The last person will go across and then they can retrieve the ropes by pulling them through the anchor. We stayed until the end and talked with them. I made notes on the gear they’d used on the crux pitch although if we did the climb a year from now that might change if the climb was done a lot. No way to know for sure. The next step was to get back to Eugene and find someplace to practice. I had an idea and Faye agreed: The west face of Monkey Face at Smith Rock. A three pitch aid route with exposure and we’d haul a bag and camp out in the back of the monkey’s head. John Ficarra has researched a lot of cars but getting the whole story on one Kremer K3 led him down a very interesting rabbit hole of understanding the back story of the Whittington Brothers. This is a brilliant story. You don’t have to be into car racing to enjoy it. I tried to embed the video, didn’t work so the link. This is an incredible piece by David Zax on affiliate marketing in the online mattress sales world. For me, the bottom line is, any site that makes money from affiliate links loses objective credibility in reviewing the products its making money linking to. If I review mattresses and also make money linking you to various mattress companies, I can easily be influenced by one mattress company offering a bigger payout for each sale I send their way. And, this is not small money: a number of these mattress review sites are making over a $1 million a year in affiliate payouts. This is an incredible story, read until the end, it will blow your mind. Tip: if you are doing research online on a product you want to buy and follow a link from a review site to, say, Amazon or the company selling the product, look closely at the URL in your browser and you can see the affiliate link clearly. If you want to support the reviewer (the linker), buy with that link, if not, change the link. Note: This site does not take part in affiliate marketing. The link below to Jason Kottke’s site does not generate income for me or him, it is simply an acknowledgement that I read about the Fast Company article at his site and followed a link from his site to the actual article. I try to acknowledge sources as I can. John Markoff interviews former iPhone engineering team members Hugo Fiennes, Nitin Ganatra and Scott Herz, followed by a second interview with Scott Forstall. This is a two hour interview, Forstall starts about 1:07 but both hours are well worth listening to. Understand that the technology that these people built changed the world and Forstall had an inkling of the importance of what they were doing but really, none of them had any idea that the iPhone would turn out to be the success it has been. This isn’t just for Apple fan-people or iPhone geeks, this will be interesting for anyone who wants a behind the scenes look at how these people’s careers took shape and how they ended up on the original iPhone team. The personal anecdotes are fascinating. I was involved with Apple in the early years of the Macintosh and this felt very much like early interviews with Bill Atkinson, Andy Hertzfeld, and others on the first Macintosh team. Historic. This event took place at The Computer Museum and regrettably, the sound and video aren’t great, but it is extremely worthwhile. Note: Scott Forstall left Apple (was let go) in 2012. Wouldn’t it be ironic (and interesting) if Forstall, like Jobs, came back to Apple later as CEO (or in some other capacity) after going through a personal transformation outside of Apple. Sometimes distance makes for a clearer head. Sara Berman’s Closet from NewYorker on Vimeo. This is a brilliant short film about the life of Sara Berman and how her closet ended up in the Metropolitan Museum of Art in New York. The film is by Bianca Giaever and Elori Kramer for The New Yorker, narrated by Maira Kalman (Sara Berman’s daughter) and written by Alex Kalman and Maira Kalman. For those of you following along, my mother passed away last Friday night. I had made a pre-arrangement ten years ago with a funeral home in Los Angeles and they handled everything including getting her safely and on time to New York for a service held graveside for her burial. I flew her remaining first cousin and his wife out as well as my mother’s helper for the past eight years so they could take part in her burial. Many relatives came who I’ve not seen in 20 plus years as well as friends and my own extended family. It was a nice group. Members of the group told stories about my mother, and her cousin who is a spritely 87 played his ukulele and sang a song he’d written for her. I knew I’d be a bit wiped out and upset so I wrote and read a eulogy which is below. I can say with little doubt that my mother would have been very pleased with this service and on her next birthday (May 26th) we’ll put a stone on her grave. It will be debated whether my mother was manic, ADHD, or just driven by high energy and insatiable curiosity but she had an unquenchable thirst for experience. What my wife calls “whiplash of the senses” my mother might not even notice. She wanted her gravestone to say: “She loved life” and when we make the stone it will include those words. Speaking of words, my mother loved them and it would flatter her to hear that people thought she had great character but it would not offend her to be called “a character” which she certainly was. My wife taught me how to live, my mother tried but it didn’t take, but my mother taught me how to open myself up to experience the world and to value my own experience and it did take and I thank her for that. Living 101 years can give a person perspective and my mother took great advantage of that perspective every chance she got. She experienced the birth of commercial airline travel all the way to men routinely walking on the moon. She didn’t walk on the moon although if it would have been possible she’d have been the first person to sign up. She did travel the world and loved every county she visited. She experienced Russia and Ukraine turning into the Soviet Union which she couldn’t visit and then back into Russia and Ukraine which she did visit to see the town her mother was born in. She proofed and edited John Steinbeck’s Cannery Row on a pile of yellow pads while at Viking Press but also got to experience reading on an iPad. She experienced the birth of the interstate highway system and the birth of the internet. She visited every national park, her favorite was Death Valley, and she connected with friends all over the world via letters and postcards as well as email and she had a large worldwide fan club on Flickr. She experienced and took part in the early civil rights movement and she lived long enough to vote for and experience two terms of Barack Obama. She had a finely honed intuitive sense of what would be good, dragging me to Leonard Bernstein’s Young People’s Concerts at Carnegie hall, seeing Hair at the Aquarius theater, Rent on Broadway, Doubt at the Forum, the King Tut show at the Met, the Picasso show at MoMA, hundreds of other plays, hundreds of movies, hundreds of books, gallery openings and almost anything that looked like it might be interesting. She was there. The few times she visited us at our house in rural Connecticut she would remark: “How can you live here, there’s nothing to do.” We did take her canoeing on a lake near us once and she liked it, but she couldn’t wait to move on to New York. She was a loyal daughter, sister, wife, mother and aunt who believed strongly in actively keeping family and friends together which she did through correspondence, phone calls, frequent family dinners at her house and frequent trips to New York for as long as she could travel. She was a creature of habit: up early, breakfast of cut orange, Special K, prunes and decaf, then into bed with paper and the daily morning phone call to cousin Doris. Frances to Doris: “Are you still alive? Then they’d go on talking for an hour. Her indulgence was lunch out almost every day, the same half tuna sandwich and blended mocha. She had a great sense of humor and wasn’t ashamed to say she enjoyed The Three Stooges but also cartoons in The New Yorker. In fact, she enjoyed being outrageous and her use of language, while sophisticated could be colorful. 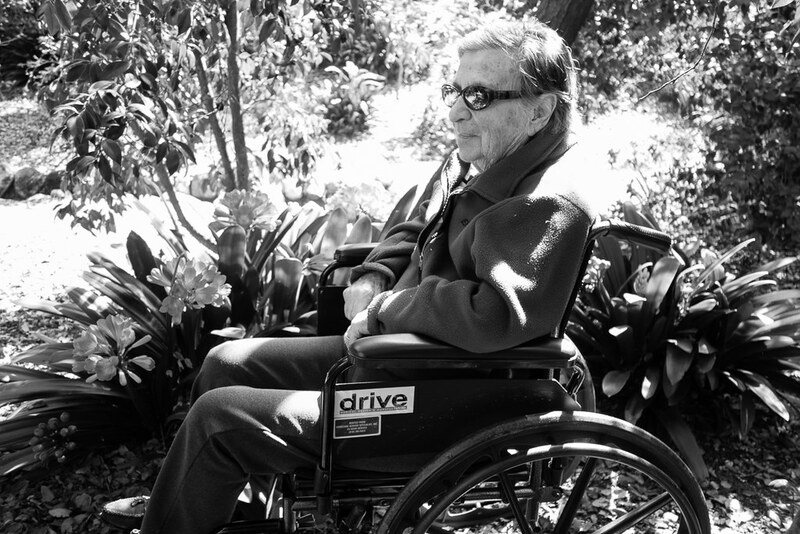 It was her wish to stay in her own house until the end of her life and as she got older and lost the ability to drive, she hired Marta Daniel to work for her. I was concerned about this because to say my mother could be “difficult” is an understatement. But, they made a great life together and Marta was with her for the last years of her life. Marta was there when my mother needed her but still allowed my mother to do her own routines and run her own life for as long as she could. There is no question that one of the reasons my mother lived until 101 was that Marta was there for her. My mother led a terrific life and was a terrific mother to me and it’s only right that her last wish be granted: she’s right next to her father wearing Anne’s yarmulke and the white dress although Mt. Hebron is in Flushing, not Brooklyn. Bendito Machine V from Zumbakamera on Vimeo. A peaceful alien lands on earth and hides for eons as earthlings destroy themselves. This is an incredible piece of animation and storytelling by Zumbakamera. Watch it full screen and enjoy the creative details.